Whales in the Sea of Okhotsk are safe from hunters today - at least for now. A Japanese whaling ship that entered Russian waters has been seized by Russian authorities, and is now docked. The 712-ton vessel, the Shonan-maru No.2, was ordered into Russian port last week after it changed course in Russian waters without going through the proper procedures. An official from Japan's Fisheries Agency told AFP that the 19 Japanese crew and one Russian observer who were on board are now being detained for questioning at the port of Magadan in the Russian Far East. Russia has not yet made public their reason for detaining the ship. 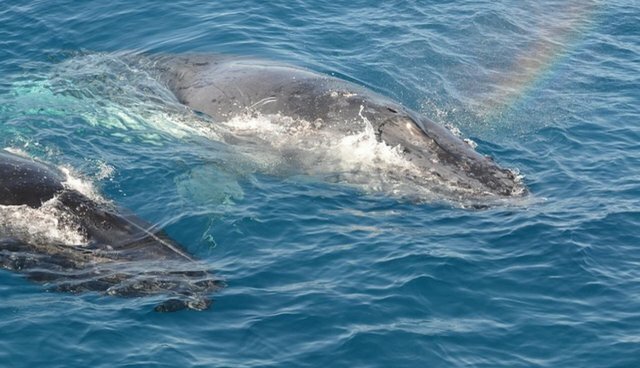 While Russia does allow some aboriginal communities to conduct subsistence hunting of some whales, the country doesn't allow commercial whaling (Russia was once one of the biggest whaling countries in the world). Under the International Whaling Commission's moratorium in 1986, commercial whaling is banned - only Norway, Iceland and Japan conduct non-subsistence whaling. The vessel is used as a spotter boat to find whales and then alert the factory ship, which harpoons the whales. This particular boat was previously used during the Antarctic whaling hunt that was deemed "unscientific" and ordered to stop by the International Court of Justice last March. The news that Japan is sending out whaling ships comes as a surprise, given that the country announced the wrap-up of its Pacific season at the end of July. Whalers killed 90 sei - an endangered species - and 25 Byrde's whales, which are protected from international trade. It was the second campaign since the Antarctic program was ordered to halt. There's no word yet on when the vessel will be released - or whether this signifies the start of another whaling campaign.